Measurements: 2.5 x 4.75 inches; or 65 x 120 millimeters. Back of card: Bright orange with two ankhs (looped Egyptian crosses) in purple outline. Booklet included: Yes, 16 pages, 2.45 x 4.5 inches; or 62 x 114 millimeters. Actually a long folded piece of paper that you'll never get refolded properly again. Publisher: U.S. Games. Printed in Switzerland. Comments: Just what the name implies, a deck for those unsure of the meanings of the cards. 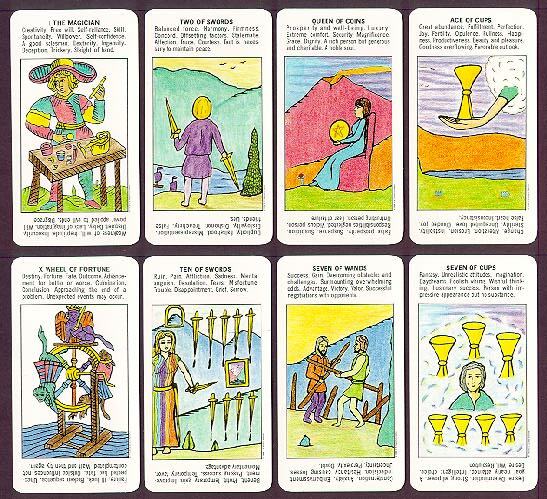 Each card has its meanings printed on it. On the top & right-side up, the meaning when right side up. On the bottom & upside down, the meaning when inverted. Illustrations are somewhat crude - which we found refreshing - & in the minor arkana are not based very much on the Rider Waite deck, despite some note I read somewhere.